In June 1986, Sun Ra, a pianist and bandleader with an adopted name, who claimed Saturn as his birthplace but was really from Alabama, and who cloaked his unclassifiably swinging music in celestial references, inaugurated SummerStage, a concert series sponsored by New York's City Parks Foundation. The next year, SummerStage's headliners included Olu Dara, another inventive musician with an invented name, who proudly claims his actual birthplace of Natchez, Miss., and whose eclectic songs feature earthy details—chickens in the backyard, a peach tree, the dust of unpaved roads. Mr. Dara, who will play a free SummerStage show at Queensbridge Park in Long Island City on Wednesday, has been elemental to the series, which this year celebrates its 25th season with more than 100 events, nearly all free, throughout the five boroughs. A nine-minute version of his "Your Lips," drawn from his 2004 appearance, appears on "Live From the Heart of the City" (Sunnyside), an album marking SummerStage's 20th anniversary. Olu Dara, seen here performing in 2008, is scheduled to play a free concert in Queens on Wednesday. If Mr. Dara has marked New York's cultural scene, so has the city shaped him. "I always refer to Brooklyn as my second home," he says, "because it's where I really started my own world." While in the Navy, he met the Yoruba priest who gave him his adopted name (meaning "God is good"). After a final year of service in port at the Brooklyn Navy Yard, he stuck around, working a succession of jobs: delivery driver, nightclub manager, hospital attendant. He held on to his horns and his Gibson and began sitting in with bands. He played in drummer Art Blakey's Jazz Messengers for a year. His purposeful cornet tone soon grew prized, especially by the avant-garde jazz musicians he worked with in the '70s. "Olu can play with one note what most people can only play in a whole solo," conductor Butch Morris once said. "I never considered myself a jazz musician," says Mr. Dara. "But I had a jazz sensibility, which I didn't find out until I worked with Blakey." Still, such music-making felt more like work than honest expression, so he formed his own band. It swung hard, drew audiences into a deep blues feeling, and often incorporated theatrical elements: Once, women with washboards, soap and water scrubbed away to the band's rhythms onstage. If mystery shrouds Mr. Dara's music, it's not just his shape-shifting aesthetic: It wasn't until 1998, at age 57, that he made his recorded debut as a leader with "In the World: From Natchez to New York" (Atlantic). A live album, "Neighborhoods," followed in 2001. "I was just never that interested in recordings," he says. "I've always been after the live thing." Mr. Dara has inspired many musicians, especially younger ones who, like him, arrived in New York from other places. For singer Cassandra Wilson, who hails from Jackson, Miss., "Seeing someone who was as country as I was and who did not try to hide it was important. Olu never talked to me about what was technically driving the music. He talked about what was emotionally driving the music, what was the story inside." And his influence extends to his eldest son, Nasir Jones, better known as Nas, the most successful rapper to emerge from the fertile hip-hop scene in the Queensbridge Houses project. On a 2004 single, "Bridging the Gap," which features his father, Nas raps: "Born in the game, discovered my father's music like Prince searchin' through boxes of Purple Rain." A bit later Mr. Dara sings, "Little Africa is where we lived, better known as Queensbridge." "That's what the neighborhood elders called this place," says Mr. Dara, who now lives in Harlem. When he plays Queensbridge Park on Wednesday Mr. Dara will make a resonant homecoming: to a concert series he's helped shape and the place where he raised his sons, in the city where he found his muse. Olu Dara is a remarkable musician and a true Renaissance man. I have had the good fortune of both knowing Olu Dara and producing concerts and dances involving him during the 80s and early 90s. Mr. Dara's music incorporates elements of jazz, blues, Caribbean and West African musics. At his core Olu Dara is a storyteller. He can weave a story out of the most mundane daily experiences. I have heard him sing songs telling stories about walking through the mud or I should say sliding through the mud on the way home to see his girlfriend. I have seen him make up songs or lyrics that have arisen from situations that have occurred in a nightclub or dance club setting. I've seen him playing and start to talk to people in the audience and begin to weave them into the fabric of the songs he is performing. 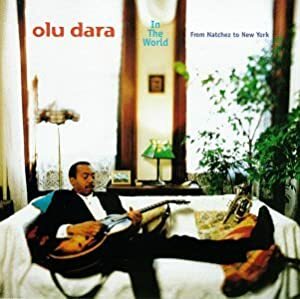 In fact one night at the old "Sweet Basil" jazz club in New York, now Sweet Rhythm Olu Dara wove me into a story that he was telling through song. Olu Dara's music relates to everyone. He knows how to reach people on a very basic, human level. He is a very funny and engaging man. Since his early days performing in New York City he has incorporated elements of theater and dance into his musical performances. He worked for years, in collaboration, with choreographer Dianne McIntyre's "Sounds In Motion Dance Company". Mr. Dara has the ability to spontaneously adjust to the movement of dancers while still maintaining a set pace and rhythm for them to work with. Olu Dara is interested in the simple things of life. I have heard him even create stories surrounding the purchase of a chicken sandwich. Olu Dara is an urban griot, a New York sophisticate with roots in the deep South. He worked as a social worker prior to his career as a musician and he brings that knowledge of people to his music. Do not ever miss the chance to see Olu Dara perform. I have seen many artists perform in my life, from all genres of music, dance and theater. Olu Dara is unique among them. He has recorded two wonderful CDs, "In the World From Natchez to New York" and "Neighborhoods". They are both well worth your purchase.